Searching files , apps and settings in window 8 is little different from other previous windows versions , so some time it become difficult for users to understand how to search things on window 8.If you doesn’t yet installed window 8 then you can look at my tutorial on how to create a bootable window 8 USB device so you can easily install it from USB .If you already have installed it but doesn’t know how to search in window 8 then let see how to do searching. So to access search box in window 8, you have to take your mouse to the top right corner of the screen ,it will pop a black strip on right hand side, see below pic how it look like. 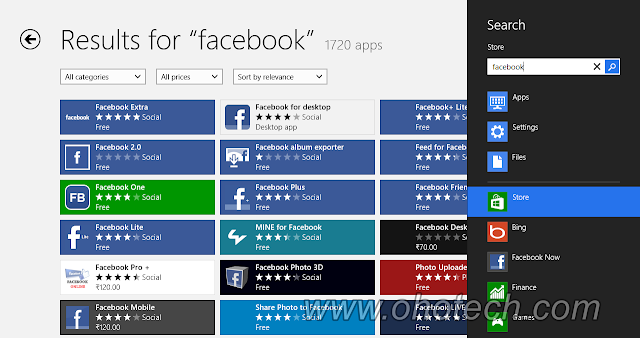 Apps are the applications that are installed on your window 8 , you can also create tiles of any application and website.By default search will search Apps only, if you want to view files and setting’s then you have to click on setting’s and files options as shown in the above pic .This is the only method to search Apps in Microsoft window store .You might notice that when you open store to download or search any Apps then by only this way you can search in the store and look for Apps that you want it.See below pic how it look. 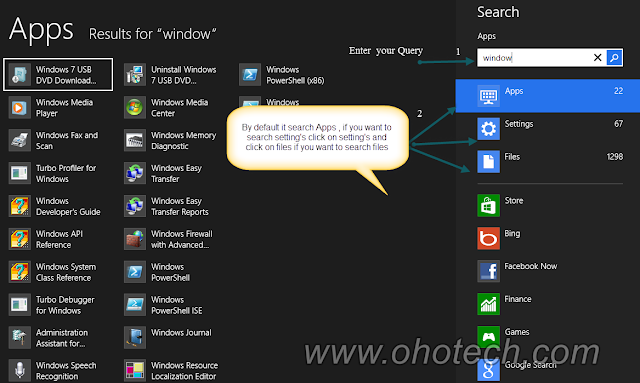 That how you will do searching window 8 , you can do search in any installed app like this ,say if you want to search in bing then choose bing and enter your query as i shown you above .That all about searching in window 8 , i hope you like my this post if you have any query then leave comment and don’t forget to like and subscribe my blog.